This pattern comes from the April 2004 Stoney Creek Collection magazine , Volume 16, number 2. 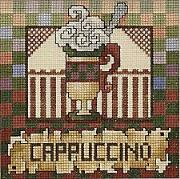 The pattern displays a cappuccino in a decorative mug in front of a decorative and colorful background. With Supplies: $34.75 You download the design. We will send you, 33 skeins of DMC Floss & Wichelt 14ct. 18" x 21" Aida (White) to complete your project.